A toddler bed tent is a wonderful piece of innovation. If your toddler has his own quiet room and has no space issues, maybe it isn’t necessary, though even then a little person will think it a super-cool way to go to sleep. Where a bed tent really comes into it’s own is when you have your toddler bed in an area where things are still going on during toddler bedtime. It gives your toddler his own quiet place and freedom from visual distractions. A toddler bed tent can also be a lifesaver for little people with autism or sensory processing disorders. To be able to shut out the whole world and go into one’s own private, non-changing space allows such children to finally relax and feel at peace. 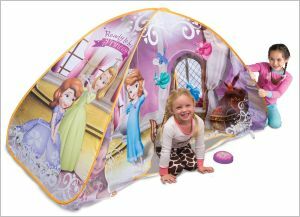 If you want your toddler sleeping into a toddler-sized bed, you will have some trouble finding a good bed tent. Almost all decent bed tents on the market are made for twin beds, which are quite a bit larger. If a bed tent is important to you, you may just want to skip the toddler bed stage and go directly to a twin bed for your little one. The sides offer containment, so it may not be as overwhelming as moving to an ordinary twin. 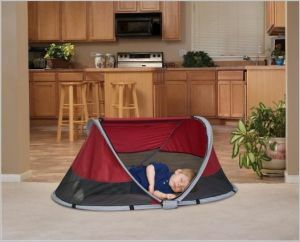 If you do want a smaller bed tent for your toddler, you can buy a that will fit him from 1-3 years old. These qualitybed tents are especially useful for travel; they fold down into a small space, they don’t take much room wherever you end up putting them, and they provide instant personal space for your little one. If you do buy one for a trip, you will want to get your toddler used to it at home first, during the day; for a toddler who has never slept in a bed tent being introduced to one at night in a strange location may just be too much. The good news is that if you do decide to go the twin bed route you have lots of options. If your child doesn’t have sensory issues, you may want a colorful bed tent that brightens up your child’s room with his or her favorite cartoon characters. 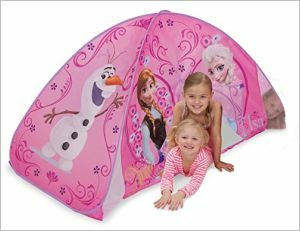 Playhut Frozen Bed Tent —Here’s a lovely pink and white tent featuring Olaf and the two sisters. Sofia Light Up Tent – Purple, blue and white, with a fun mesh window for peaking out of, this bed tent is ideal for little Sofia fans. 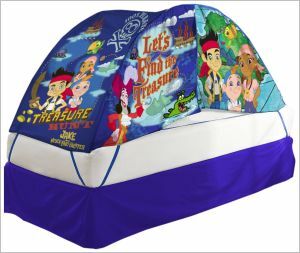 Jake and the Pirates Bed Tent —This blue bed tent is perfect for your two-legged toddling pirate. Are bright colors on his bed tent overwhelming for your child? 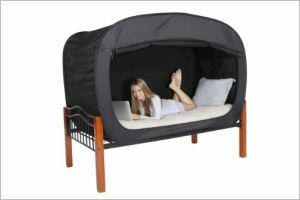 A child who needs a sleep environment without any distractions should have as simple a bed tent as possible, and a Privacy Pop Bed Tent? may be just that. This simple black, block-shaped bed tent fits perfectly over a twin bed and changes the bed into personal space that is separate from whatever else might be around. Two sides can be almost fully opened, so your child can play or read on his bed during the daytime without blocking himself out, but when he needs to go to bed you can zip it completely, blocking out almost all light. May your toddler sleep peacefully and through the night in his toddler bed tent!